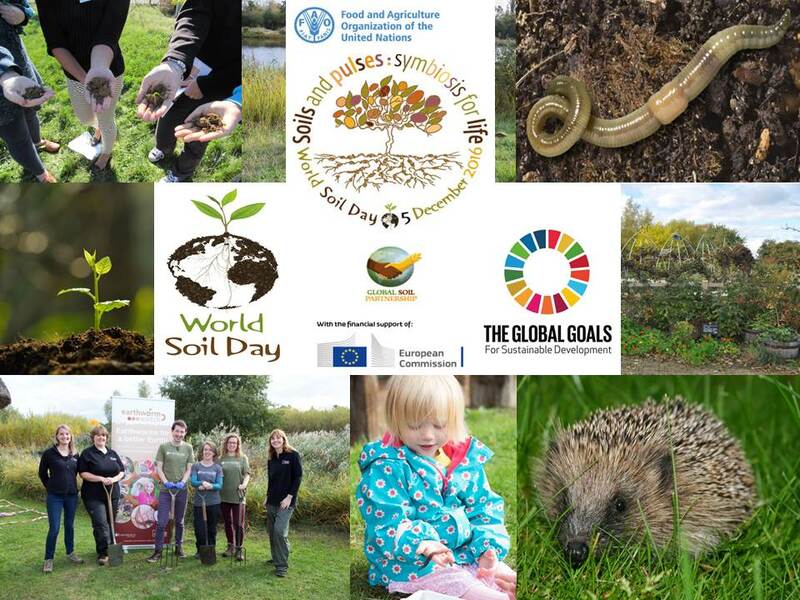 Today is World Soil Day – an important annual occasion aimed at raising awareness of the critical role that soils play in our lives. Soils are important for everyone, as almost everything we need to survive is dependent on them. If you think about the clothes on your back, the food that you eat, the air that you breathe or the water that you drink, essentially it can be traced back to the soil. Clothes (or parts of them) are nearly always made from raw materials that are grown as plants and coloured with dyes found in plants. The fruits and vegetables we eat are grown in soil or on trees that need soils for nutrients and water. If you eat meat or dairy products, then the livestock managed by farmers requires large areas of grazing land. Soil is needed to grow the food to raise these animals. Some of the air that you breathe will almost certainly have come from trees and other plants that again require soil to survive. Finally, water falls as rain and ends up in seas, lakes and river systems, but also falls on land. So, where does it go? It is stored in the soil and underlying rock which forms the water table. Earthworms can help this process – through their burrowing activity, earthworms aerate the soil by creating spaces which can help to store air and water and reduce flooding. Soils play a part in regulating our climate, but how is this done? Soils actually store carbon in the form of decaying organic material. Soils are the biggest reservoir of carbon on the planet, second only to the oceans. With soils being able to hold four times more carbon than all the plants and trees in the world, earthworms can play a vital role in carbon storage. Through their actions, earthworms consume and store tiny fragments of dead plants, microorganisms and animals that live within the soil, locking away carbon. This can help to reduce levels of carbon dioxide in the atmosphere. At the United Nations Sustainable Development Summit in September 2015, 193 countries agreed upon a series of ambitious goals focussing on global challenges such as food security, freshwater availability, the loss of biodiversity, pollution, and climate change. Several of these Sustainable Development Goals recognise the importance of healthy soils. Goal 17, for example, ‘Life on Land’, aims to sustainably manage forests, combat desertification, and halt and reverse land degradation and biodiversity loss. Protecting soil and halting its degradation due to activities such as intensive agriculture, erosion, flooding and climate change will be key to meeting the goal’s targets. Closer to home, the 2016 UK State of Nature report indicated that Britain is one of the most nature-depleted countries in the world, despite our passion and enthusiasm for wildlife. One in 10 of our species of highest conservation concern are under threat of extinction, including iconic species such as hedgehogs, kingfishers and dormice. Hedgehogs, for instance, have declined by one-third since the year 2000, and depend on soil-dwelling creatures such as earthworms for food. Earthworm Watch’s mission is to understand the impact that human activities such as planting schemes, moving topsoil and adding fertilisers affects soils and earthworms, especially in gardens and other urban green spaces. It has been shown that allotments in urban areas are often far healthier places in terms of soil productivity than areas that are intensively farmed, as they contain higher levels of organic matter and nutrients. Initial results from Earthworm Watch also show that there is a higher density of earthworms in vegetable beds that contain more organic matter. The State of Nature report indicates that it is human activity in the form of intensive farming and habitat fragmentation that is having some of the most damaging impacts on our wildlife. Earthworm Watch seeks to map the distribution of earthworms to better understand their impact on soil health, and in doing so find ways to maintain soil health. Earthworms may be able to mitigate the effects of climate change and improve the state of our magnificent wildlife that desperately needs our help. If you want to help our soils and wildlife, why not dig for earthworms and help scientists learn more about the diversity and activities of earthworms in different soils? There are practical things that you can do to improve the soil for earthworms and other wildlife in your garden or green space: you can create micro-habitats for earthworms and wildlife; you can compost; or you can use a wormery to help recycle household and garden waste. You can also spread organic material over your flower or vegetable beds, which has shown to be beneficial for earthworms. Our soils do so much for us that we take for granted, so if you care about healthy soils, please continue to support Earthworm Watch. World Soil Day is organised by the Food and Agriculture Organization of the United Nations (FAO), whose aims are to ensure food security, the elimination of poverty, social progress and the sustainable use of natural resources for the benefit of present and future generations.